What needs to be in place for all children to successfully cross the bridge between pre-K, kindergarten, and the early grades of elementary school? San Francisco Unified School District leadership has some answers and lessons for other districts considering PreK-3rd grade reforms. 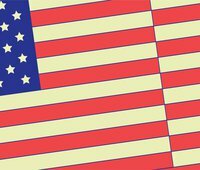 In 2008, SFUSD leadership developed a plan to implement a PreK-3rd grade approach in an effort to shrink the district’s stubborn achievement gap. 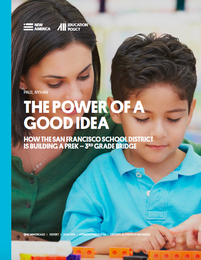 A new report from New America’s Early Education Initiative, The Power of a Good Idea: How the San Francisco School District is Building a PreK-3rd Grade Bridge, tells the story of the district’s transformative shift. Built data systems and kindergarten readiness measures. From the report: “Perhaps the district’s most significant change was to elevate the director of the Early Education Department [Carla Bryant] two levels to a cabinet-level position, giving her more leverage in decisions and a higher profile.” Nyhan also notes the critical role principals play. “In many ways, principals are the field marshals of education reform because they can advance a strategy by integrating it into the common vision and language that are hallmarks of strong schools. Early results from participating schools show these strategies are changing adult behavior and improving kindergarten readiness. PreK-3rd teachers are collaborating, planning together, and communicating more regularly, especially pre-K and kindergarten teachers. Kindergarten teachers report, more than ever before, that the students in their classrooms who attended pre-K the prior year are ready to meet kindergarten expectations. SFUSD leaders recognize there is still much work to do particularly in three areas: 1) building relationships and connections with pre-K providers not affiliated with the school district; 2) strengthen the bridge from kindergarten to 1st, 2nd, and 3rd grades; and 3) expand the strategies district-wide. An extensive body of research shows the high-quality pre-K leads to strong short-term and long-term outcomes for children, especially children from low-income families. And to maximize outcomes for children, it is essential that pre-K be followed up by well-connected and coordinated teaching and learning in kindergarten and the early grades of elementary school.